This article is deprecated and will be updated in further UNIGINE updates. 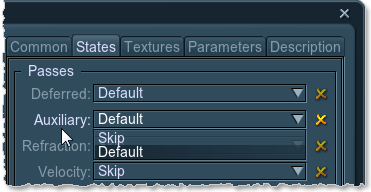 Set it (or a material inherited from it) in Render settings -> Composite shader field. Make sure that Main menu ->Render tab -> Auxiliary buffer option is checked. Go to the surface material. Set States tab ->Passes -> Auxiliary pass and set itDefault. It means that the material is rendered into the auxiliary color buffer. It is also possible to mask materials for two postprocesses using surface material -> Parameters -> Auxiliary Color (see blur_mask and dof_mask below). Mask to exclude objects from Motion blur. Skip - all materials are rendered blurred. 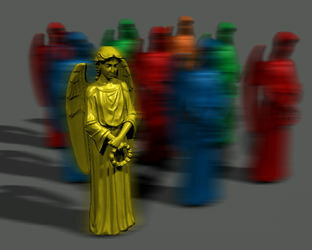 red - materials that have Auxiliary Color with non-zero Red channel value are excluded from motion blur. 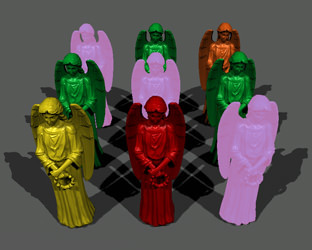 green - materials that have Auxiliary Color with non-zero Green channel value are excluded from motion blur. Mask to exclude objects from DOF effect. Skip - all materials are rendered with DOF effect applied. 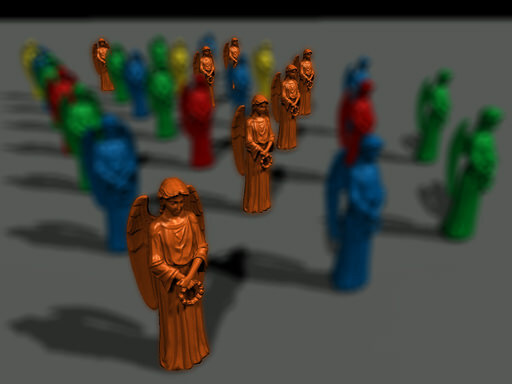 red - materials that have Auxiliary Color with non-zero Red channel value are rendered without DOF effect (non-blurred). 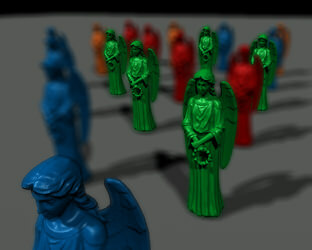 green - materials that have Auxiliary Color with non-zero Green channel value are rendered without DOF effect (non-blurred).